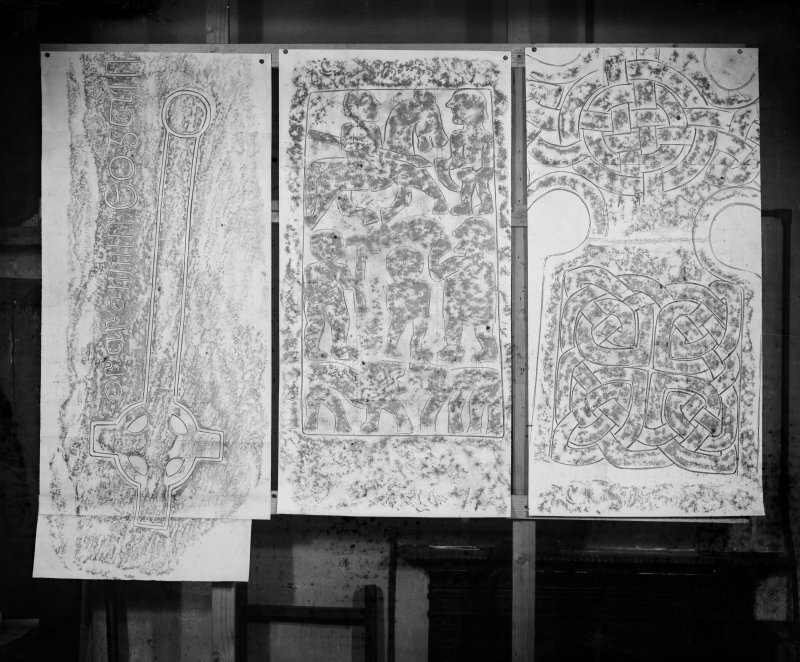 Photographic copy of three rubbings showing an incised cross from Iona and two detail of the Barochan Cross. 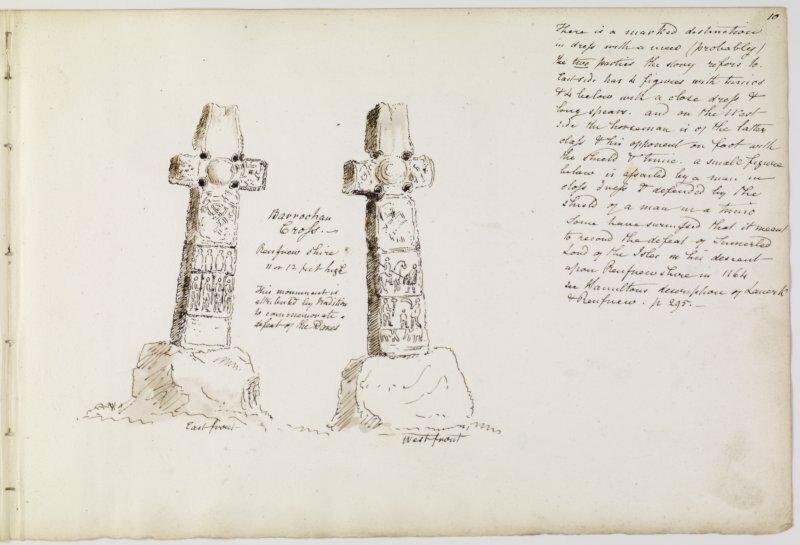 View of Barochan Cross from W.
Drawing showing front and back of Barochan Cross. 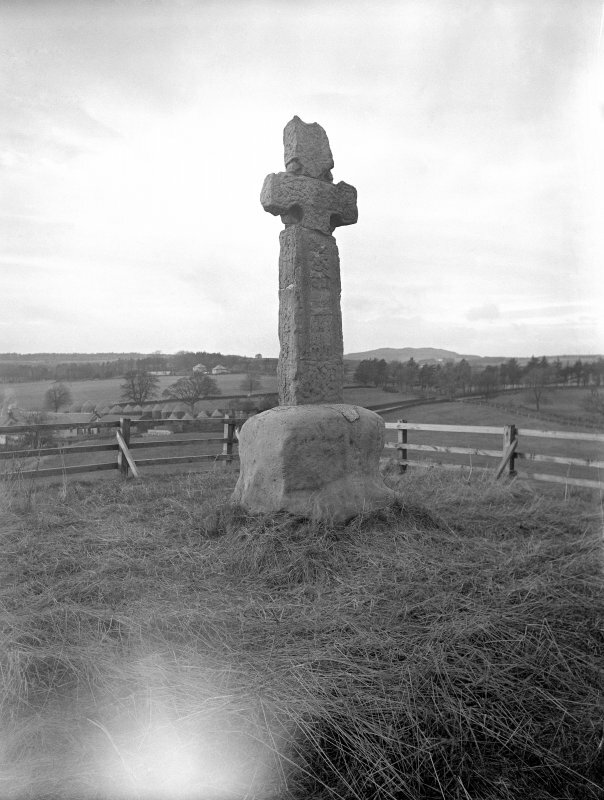 Titled: '“Barrochan Cross, Renfrewshire. 11 or 12 feet high. This monument is attributed by tradition to commemorate a defeat of the Danes'. Present location: in the south-west corner of the nave of Paisley Abbey. 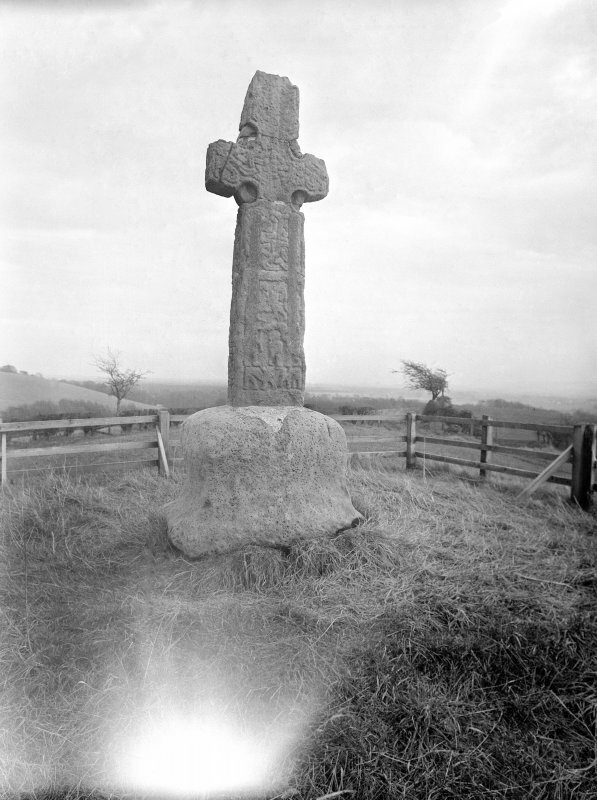 Evidence for discovery: first recorded by Skene in 1832, the cross stood in a base just south of the Mill of Barochan on the north side of the Barochan Burn. Towards the end of the nineteenth century it was moved to a knoll farther south of the mill, and in 1924 it was taken into State guardianship. 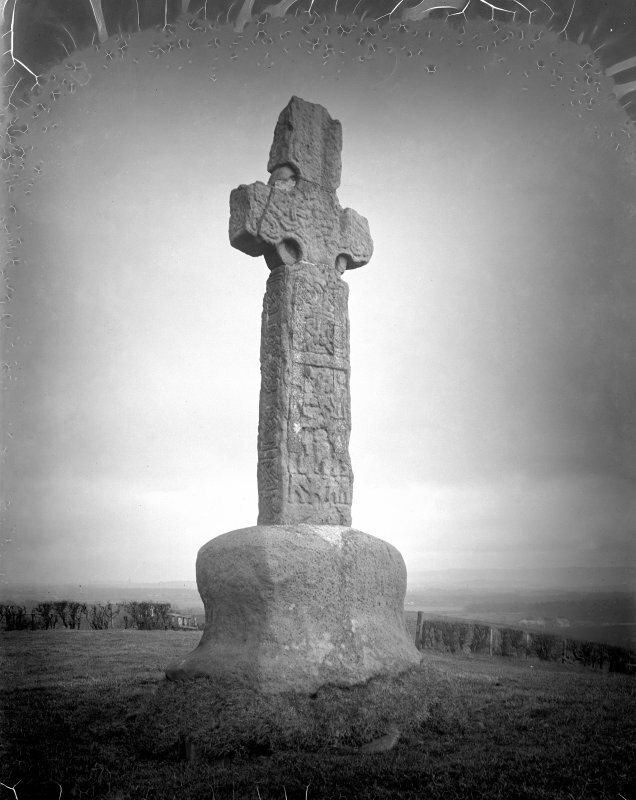 In the 1980s it was removed for conservation and placed in a new concrete base in Paisley Abbey, while the original base was left in situ on Corslie Hill. Present condition: severely weathered, especially the head. The head has been reconstructed prior to 1832 from three fragments, and the shaft from at least two fragments (the breaks are shown clearly in Stuart 1856). 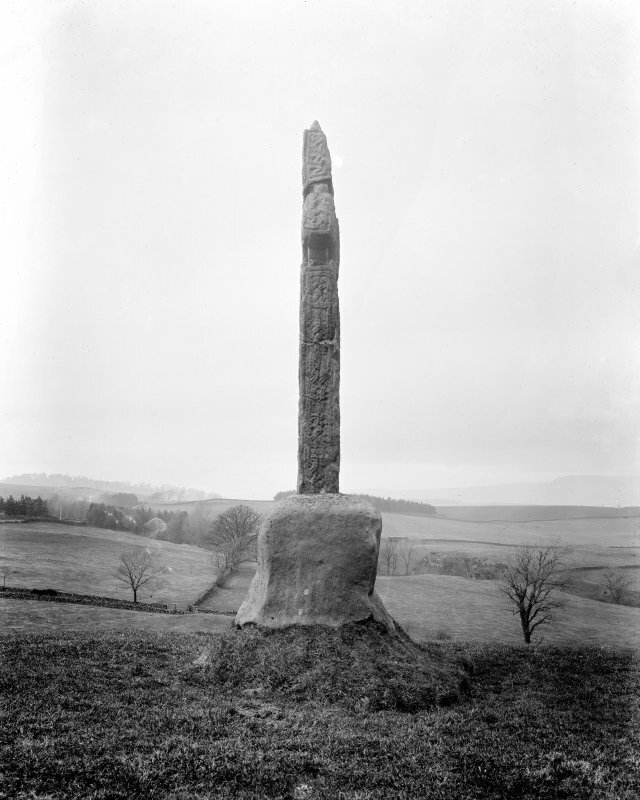 Parallel vertical slots on face C suggest re-use as a gatepost prior to the move to Corslie Hill (these are visible on photographs of 1924 and 1927). At some point after 1927, considerable restoration of the damaged areas was undertaken, obscuring many of the details recorded in the nineteenth century. 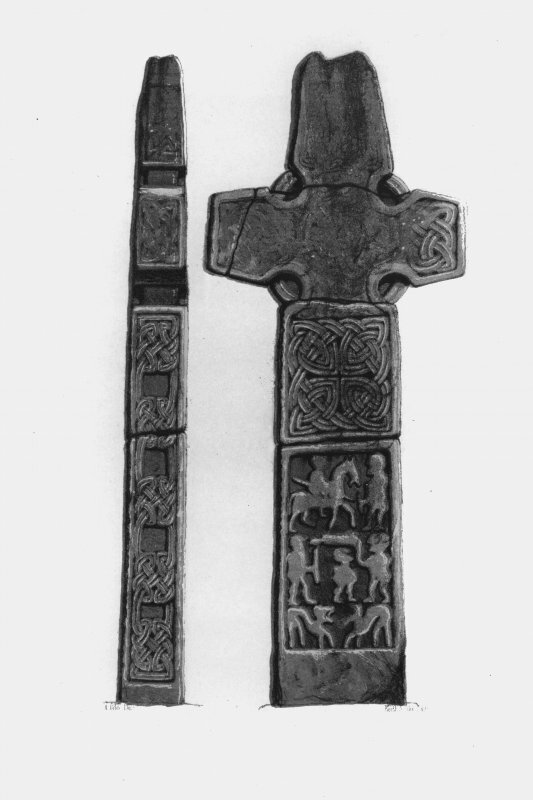 This substantial cross has a head of Corpus type 12c with chamfered arms, but in addition the arms are linked by plates within the armpits, which have a wide moulding to convey the overall impression of a ringed cross. The entire cross is carved in relief and bordered by a wide plain moulding, and the panels of ornament are separated by plain bands. There is ornament on every face except the ring-plates, but the upper arm is badly defaced by erosion. All the curvilinear interlace uses median-incised cords. On face A at the centre of the cross-head are two concentric rings interwoven by pairs of cords extending out into the arms where, on the intact side-arms, they form interlaced knots. There are also knots on the ends of the side-arms. Below the head on face A there is a panel of interlace in which the voids form a cruciform design, and below there is a large figural panel. This is composed in three registers: at the top a horse and rider facing right, the rider carrying a spear, and in front of the horse a figure apparently offering the rider a drinking horn. Below on the left a frontal figure with an axe, in the middle a smaller frontal figure flanked on the right by a large figure in profile hold an object over the head of the central figure. At the bottom are two confronted quadrupeds. 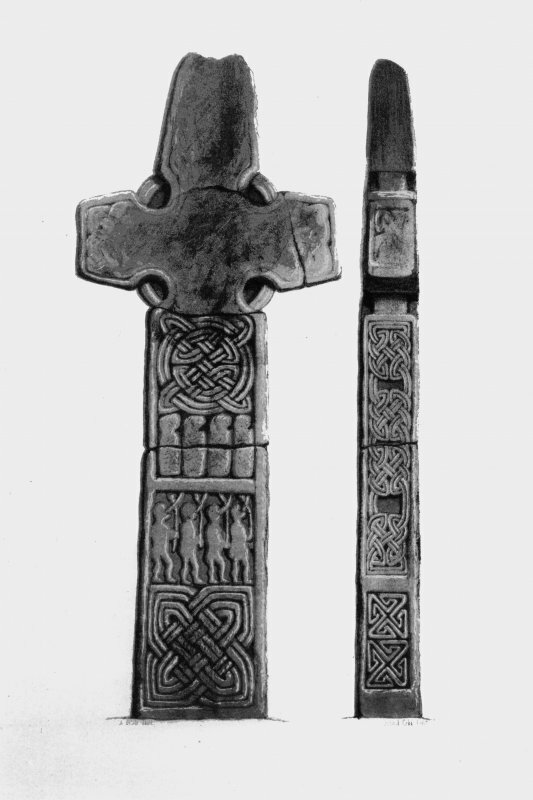 On face C the cross-head is filled with continuous interlace, and the shaft is divided into two panels. The top panel contains a large ring-knot above four frontal figures in full-length hooded cloaks. The lower panel contains four figures in profile facing right, who wear short tunics and are blowing horns held upright (those on the extreme left and right are largely defaced by the secondary slots). The rear three figures also carry spears. Below them is a double ring-knot. Face B of the shaft is carved with a single long panel of five linked interlace knots, with four square voids between the knots. Face D is divided into two panels, the upper containing four linked knots with square voids between the central pair and those above and below, and the lower panel composed of two conjoined key-pattern knots. The base is roughly rectangular and devoid of ornament. References: Skene 1832, 10; Stuart 1856, 35-6, pls 115 & 116 (faces B and D are transposed); ECMS pt 3, 454-6; Driscoll et al 2005, 146-8. 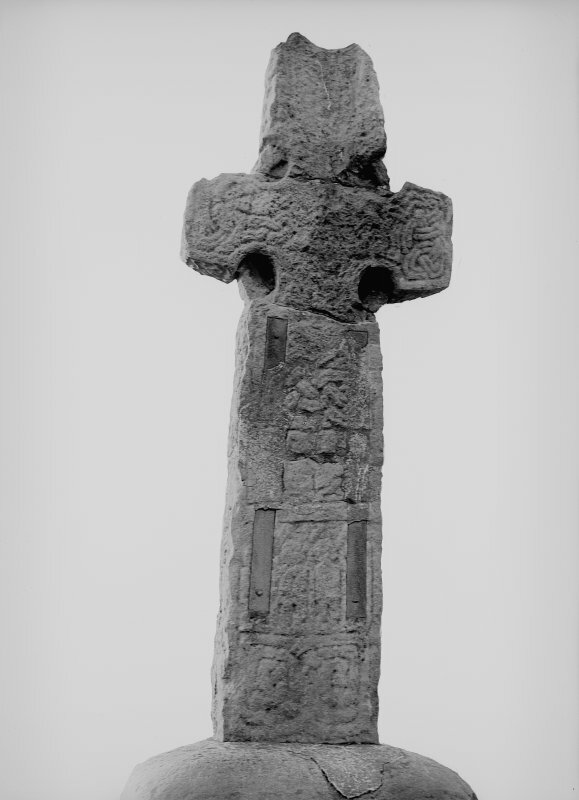 This cross has been moved from Barochan and, after conservation, re- erected in Paisley Abbey (NS46SE 2.04). It has been moved on at least one previous occasion, being first recorded standing a little to the S of Mill of Barochan (NS 404 698) from whence it was removed in the late 19th century to the top of a prominent knoll opposite Corsliehill. It is an erect standing sandstone cross which rises to a height of 3.4m, the lower 0.9m of which would normally be buried. Interlace forms the principal decorative motif with, on the front and rear faces, panels of human and animal sculpture. 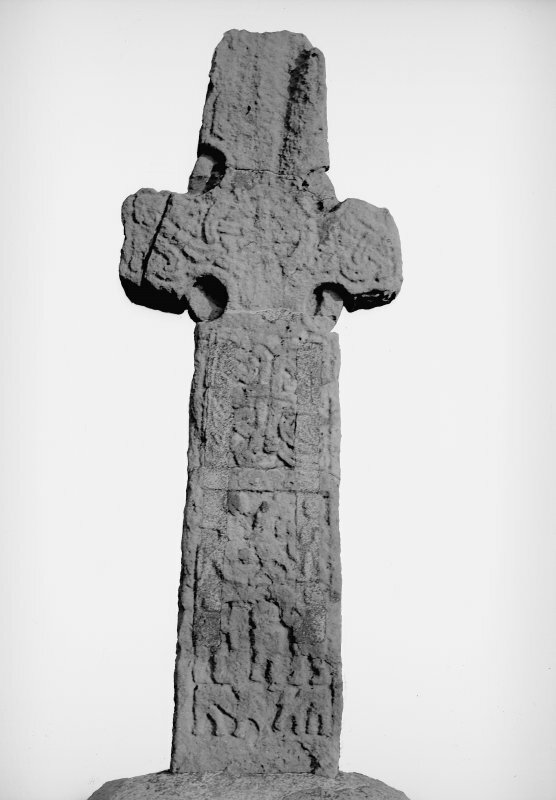 The cross cannot be dated accurately but is probably early in the Strathclyde series of sculptured stones and may be as early as the 8th century. J Stuart 1856; J R Allen and J Anderson 1903; E W MacKie 1975; N Reynolds 1979; J B Stevenson 1985. 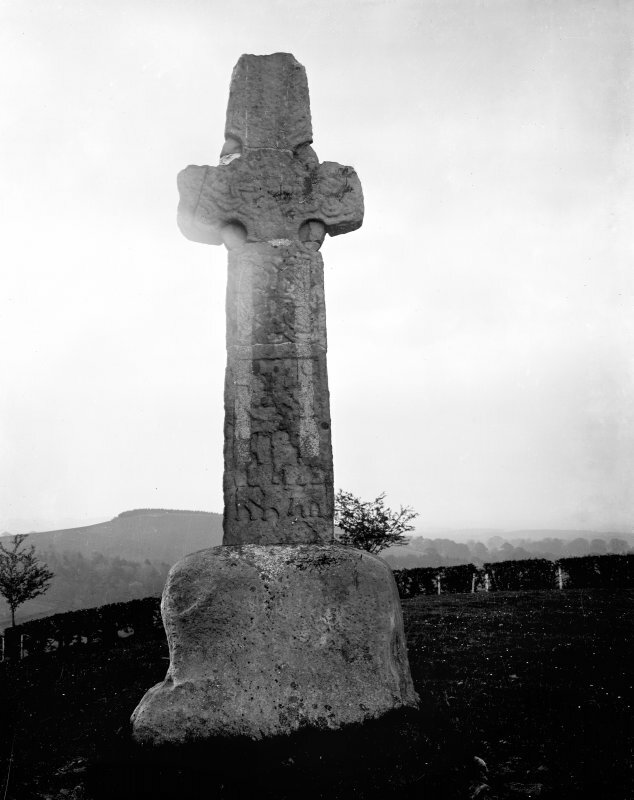 Photographs of the Barochan Cross, Renfrewshire, taken in 1924 by the Office of Works. This cross has recently been moved from Barochan and, after much needed conservation, it has been reerected in the shelter of Paisley Abbey. The stone has had a chequered history, having been moved on at least one previous occasion, and serves as a timely reminder of the portability of even comparatively large monuments. 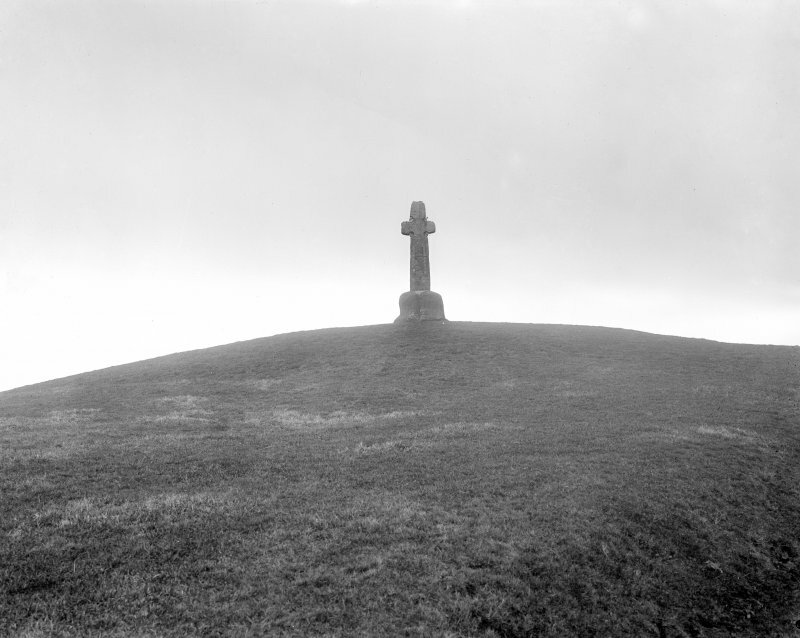 It was first recorded standing a little to the south of Mill ofBarochan (NS 404698) from whence it was removed in the late 19th century to the top of a prominent knoll opposite Corsliehill (NS 405690). 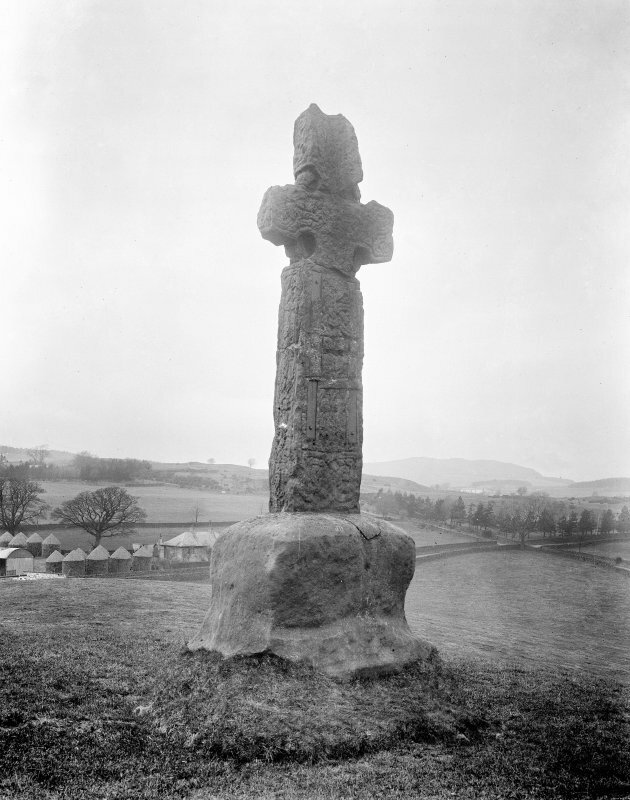 It is an erect standing cross of pale, probably local, sandstone which rises to a height of 3.4m, the lower 0.9m of which would normally be buried. The decoration is badly weathered and the stone as a whole has deteriorated much in recent times, but viewed from a distance it is not difficult to imagine it in its former glory. Interlace fonns the principal decorative motif with, on the front and rear faces, panels of human and animal sculpture. The front panel is divided into three zones: a mounted warrior carrying a spear confronting a man holding a drinking horn, at the top; a small human figure flanked by two men, one of whom holds an axe, at the centre; and, at the bottom, a pair of beasts facing one another (the latter are similar to a pair of animals on the side of the first stone described at Inchinnan, no. 66). On the rear there are two panels, with the bottom half of the upper and the top half of the lower bearing human figures. The upper four figures wear cloaks, and those in the lower panel carry spears and are blowing horns. 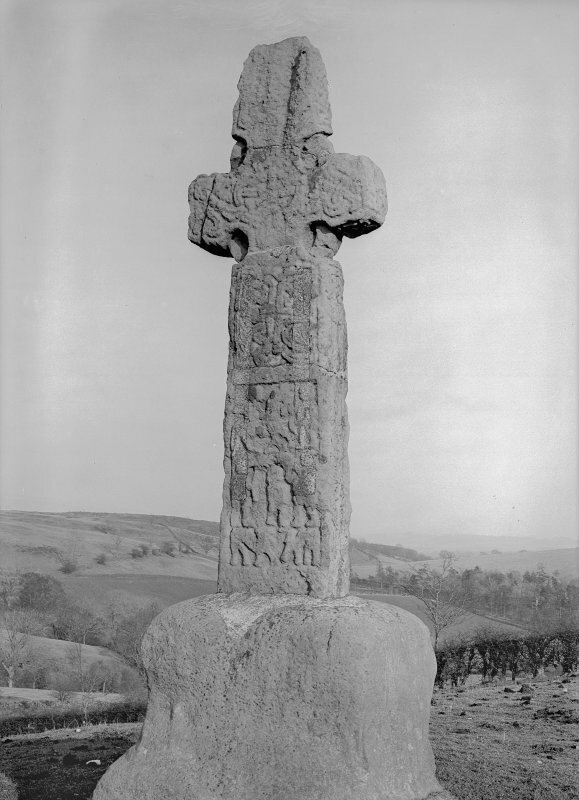 The cross cannot be dated accurately but it is probably early in the Strathclyde series of sculptured stones and may be as early as the 8th century.